The 1968 Mustang Bullitt was a Highland Green 1968 Mustang GT fastback used in the 1968 movie Bullitt starring Steve McQueen. It is a significant movie due one of the best car chase scenes ever filmed. The popularity of this movie has inspired many 1968 Mustang owners to create their own versions. You basically take a 1968 GT Mustang, paint it Highland Green and add American Racing Torque Thrust wheels. In 2001 Ford created their own Highland Green (avail in black too) Mustang Bullitt special model. They did it again in 2008 and 2009. Replica of the 1968 Highland Green fastback GT 390ci V8 from the Steve McQueen movie Bullitt famous for its car chase through the streets of San Francisco. This Ford promotional photo has Steve's son Chad driving, and is our Attitude Of The Week for the week starting March 4th, 2012. 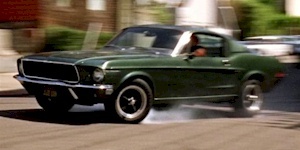 Have you seen the 1968 movie called Bullitt staring Steve McQueen and this Highland Green 1968 Mustang GT fastback? If you haven't, you better go out and get the movie and watch it. The movie has the best car chase scenes ever filmed. The scene featured this Mustang chasing two hit-men in a black 1968 Dodge Charger R/T 440 Magnum. It was 9 minutes and 42 seconds long. Speeds exceeded 110 mph and Steve McQueen did most of the actual driving!